During the second KErguelen Ocean and Plateau compared Study (KEOPS2) in October-November 2011, marine snow was formed in roller tanks by physical aggregation of phytoplankton assemblages sampled at 6 stations over and downstream of the Kerguelen Plateau. 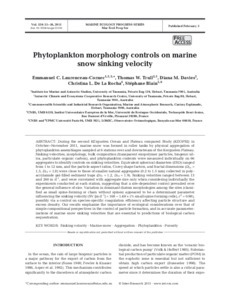 Sinking velocities, morphology, bulk composition (transparent exopolymer particles, biogenic silica, particulate organic carbon), and phytoplankton contents were measured individually on 66 aggregates to identify controls on sinking velocities. Equivalent spherical diameters (ESD) ranged from 1 to 12 mm, and the particle aspect ratios, Corey shape factors, and fractal dimensions (DF1 = 1.5, DF2 = 1.8) were close to those of smaller natural aggregates (0.2 to 1.5 mm) collected in polyacrylamide gel-filled sediment traps (DF1 = 1.2, DF2 = 1.9). Sinking velocities ranged between 13 and 260 m d-1, and were correlated with aggregate size only when considering individually the experiments conducted at each station, suggesting that a site-dependent control prevailed over the general influence of size. Variation in dominant diatom morphologies among the sites (classified as small spine-forming or chain without spines) appeared to be a determinant parameter influencing the sinking velocity (SV [m d-1] = 168 - 1.48 × (% small spine-forming cells), r2 = 0.98), possibly via a control on species-specific coagulation efficiency affecting particle structure and excess density. Our results emphasize the importance of ecological considerations over that of simple compositional perspectives in the control of particle formation, and in accurate parameterizations of marine snow sinking velocities that are essential to predictions of biological carbon sequestration.